The fellow sitting beside us in the bar blamed Brexit for the rugby defeat. 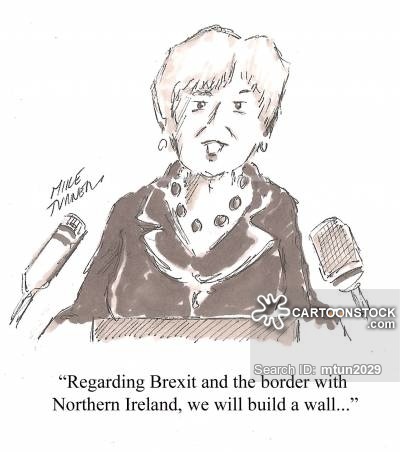 “There’s your hard border for you.” he said, pointing to the television as yet another Irish assault on enemy ranks was thwarted and driven back by a thin white line. This guy seemed to have Brexit on the brain. However, he may well have been right. The English wall seemed impenetrable as Ireland launched attack after attack, only to be stopped dead in their tracks. Murray tried his usual aerial bombardment but to little effect as the visitors returned the high ball with interest. The English pack were in rampant mood and were up fast to every break. The backs looked menacing in possession. As the game progressed, Ireland were like a team running out of ideas. We could point to a fortunate bounce, an outrageous pick-up and a blatant forward pass for three of the England tries. However, in fairness, we were out-thought, out-fought and out-manoeuvred by a better team on the day. Our Grand Slam and Triple Crown titles are gone, but the great weight of expectation has also been lifted from our shoulders. We travel to Scotland next weekend as hot favourites. 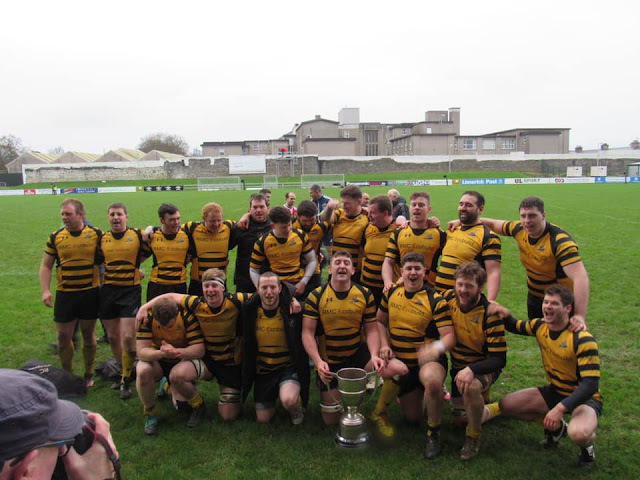 Abbeyfeale RFC celebrate following their 22-19 win over Newcastle West in the Transfield Cup final. DEATHS; The death has occurred of Eileen (Eily) O'BRIEN (née Lyons) Bridge Street, Abbeyfeale. Pre-deceased by her parents Davy and Eily and husband Billy. Sympathy is extended to her bereaved daughters Lee and Julie, son-in-law Tim Collins, grandsons Gearóid and Tiernan, friend Kathleen O'Donnell, brother Stephen, brothers-in-law, sisters-in-law, niece Eimear, cousins, nieces, nephews, relatives and a wide circle of friends. Sympathy is also extended to the family of Anna Mai Lane whose funeral took place Tuesday. Also to the family of Mary Hickey whose funeral took place on Monday. May they rest in peace. ABBEYFEALE HARRIERS ANNUAL HUNTING FESTIVAL: Sunday, February 10 – Shanahan’s Bar, Strand, Co. Limerick. Joint Meet; Ballybrown Harriers and Tipperary Foot Harriers. Monday, February 11- Fleming’s Bar, Scartaglin, Co. Kerry. Joint Meet; Rockfield Harriers and Rooves Bridge Harriers. Memorial Meet for John O’Connor and Anthony Cronin. Tuesday, February 12 – Naughtons’ Bar Mountcollins, Co. Limerick Brosna Foxhounds. Wednesday, February 13 – The Goalpost Bar, Tournafulla, Co. Limerick. Carraigshane Harriers. Thursday, February 14 – Walsh’s Bar, Knocknagoshel, Co. Kerry. Joint Meet; Lismore Harriers and South Tipperary Harriers. Friday, February 15 – DP Lyons Bar, Abbeyfeale, Co. Limerick. Joint Meet; Bridgetown Harriers and Minerock Harriers. Memorial Meet for Jackie O’Grady. All meets at 11am. Food kindly sponsored by publicans. Hunting is on foot and the quarry is fox – Cap €10 per meet. Please show respect to landowners and their property at all times. Enquiries: Doug McGuinness (Hon. Sec. Abbeyfeale Harriers) 087 6829044 or Paddy O’Grady 087 6258933.Supported Charity – The Irish Cancer Society. SET DANCING WEEKEND: West Limerick Set Dancing ceilis; Friday February 8 at Devon Inn with music by Taylors Cross 9 till late. Saturday, February 9 ceili at 9pm with The Striolan Ceili Band. Sunday, February 10 Afternoon Ceili with Johnny Reidy from 2- 5pm. Workshop on Saturday from 10.30 – 12.30pm and 2 – 4.30pm.